Add sour cream and lemon pudding to make this delicious mandarin orange cake rich and moist. 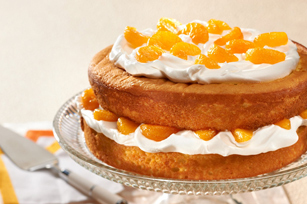 Creamy Mandarin Orange Cake has delicious layers of citrus. Beat cake mix, dry pudding mix, 1 cup sour cream, water, oil, eggs and orange zest with mixer until blended. Pour into 2 greased and floured 9-inch round pans. Bake 25 to 30 min. or until toothpick inserted in centers comes out clean. Cool cakes in pans 10 min. Invert onto wire racks; gently remove pans. Cool cakes completely. Whisk remaining sour cream and sugar in large bowl until blended. Stir in COOL WHIP. Stack cake layers on plate, filling with half each of the COOL WHIP mixture and oranges. Frost top with remaining COOL WHIP mixture. Garnish with remaining oranges. Keep refrigerated. Prepare using COOL WHIP LITE Whipped Topping, and BREAKSTONE'S Reduced Fat or KNUDSEN Light Sour Cream. Prepare as directed, using a chocolate cake mix and 1 pkg. (3.9 oz.) JELL-O Chocolate Flavor Instant Pudding, and substituting 1 cup fresh berries, such as raspberries, sliced strawberries or blueberries, for the oranges. The COOL WHIP filling can be prepared in advance. Store in tightly covered container in refrigerator up to 2 days before using as directed.